New York, NY: Vintage Books, 1988. Text/Near New, showing faint margin discoloration. Illustrated soft cover/VG; Strong & sound w/vertical crease parallel to spine to front. Exciting account of award winning photographer, travel writer, and documentary-maker Nick Danziger's 18-month overland trip from London to Beijing in 1984 - 85. 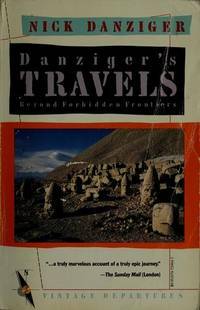 An extraordinary adventure of modern travel without visas and in disguise as an itinerant Muslim discribes encounters with officialdom, Iranian fundamentalists, Afghan mujahedeen, Uighur peasants, and, Chinese communists ... oh yes, the trip cost him short of $1,500! A thrilling excursion.. First Edition, 3rd Printing. Soft Cover. Very Good/None as Issued. Boise, Idaho: Burning Mountain Press, 1999. First Edition, First Printing. Author signed. Text/BRAND NEW & Bright.. Gilt embrossed steel grey linen boards/Fine. DJ/NF w/faint creasing to lower front corner, rubs to corner tips, and short closed tears to upper spine edges. Map to endpapers. LAID IN: Publication promotion materials. STICK: Any number of parachutis dropping together (Webster's Dictionary. Smokejumpers parachute to remote areas to combat fires. Initiated in the 1930s, American smokejumpers are a part of US Forest Services; other countries with smokejumpers are Russia and Canada. This memoir recalls first hand experiences of the 1950s. 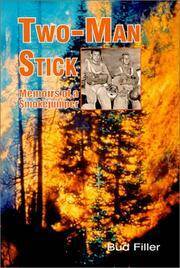 A unique book that ought to be read in conjunction with Norman Maclean's classic, Young Men and Fire, which takes a close look at Montana's Mann Gulch fire of August, 1949 which took the lives of of 12 of a team of elite ariborne firefighters within two hours of parachuting.. First Edition, First Printing. Hard Cover. Near Fine/Near Fine. Santa Barbara, CA: Capra Press, 1987. BRAND NEW Copy. Volume X of Capra Back-to-Back Series. Two books in one volume. The first Angels Burning by Thomas Sanchez; first serialized in Esquire, it is a narrative of when Santa Barabara was nearly burnt to the ground. The second, "Ocian in View" by Lawrence Clark Powell, describes a wildfire racing through Malibu.. Unstated. Soft Cover. Fine/None as Issued. Berkeley, CA: Univ of California Press, 1993. BRAND NEW & Collectible. First Edition, First Printing. Personal memoir of Director Emeritus of the University of California Press. 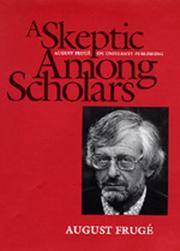 "Skeptic" meaning one who admires books of learned scholars, but with reservation. August Fruge guided and nurtured the UC Press from 1944 to 1976, bringing it up from a modest printing department to the formidable and respected major academic press it is today.. First Edition, First Printing. Soft Cover. New/None as Issued. New York, NY: Penguin, 1996. Text/NEW. Soft cover/NF w/trace edge wear. 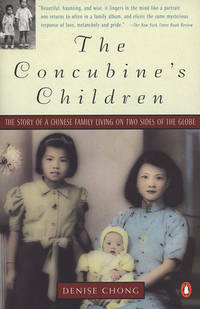 A 3-generation family biography, a memoir, a social history of modern Chinese immigration woven from memories, letters and old photographs, and narrated by a Canadian-born granddaughter. The family saga begins with poverty stricken peasant Chan Sam's immigration to Canada in 1913, two years after the collapse of the Ch'ing Dynasty. He sends for a young concubine whose labours help maintain the two households separated the oceans. An ultimate family reunion takes place some sixty years later following the intervention of the Sino-Japanese War, World War II, and ensuring civil war leading up to Communist control of the China mainland.. First Edition, First Pinting. Soft Cover. Collectible - Fine/None as Issued. First Edition, First Printing.